Talk about a misnomer... though they may look like toothy Sharks externally, the various Minnows (family Cyprinidae) sold as freshwater sharks don't even have teeth in their mouths! However, many of these "minnow sharks" do share some behavioral traits with their marine namesakes... territoriality with Labeo and Epalzeorhynchos species can be extreme to the point where one cows its congeners into starvation. Some individuals become merciless in pursuing slower fish tankmates as well... Ironic as it may seem, for all their potential and real "mean-ness" the number one cause of loss of these fishes is simple "jumping out... Any small opening of adequate size in their system will do. Genus Balantiocheilos: Balantiocheilus in older literature. One species. Balantiocheilos melanopterus (Bleeker 1851), the Bala or Tri-Color Shark. Asia; Thailand, Laos, Malaysia, Indonesia. To fourteen inches in length. Cond.s: pH 6-8, dH 6-12, temp. 22-28 C. Endangered status. Best kept in large quarters, at least 55 gallons, in a small grouping. Epalzeorhynchos bicolor (Smith 1931), the Redtail Sharkminnow to science was Labeo bicolor, the Red Tail shark to the aquarium hobby. Found originally in Thailand. Grows to a bit under five inches in length (if it doesn't jump out first). Cond.s: pH 6.5-7.5, dH to 15, temp. 22-26 C. There are mutations of this species including albino. Epalzeorhynchos frenatum (Fowler 1934), the Rainbow Shark, Sharkminnow. Asia; Mekong, Chao Phraya and Xe Bangfai Basins. To six inches in length. Cond.s: pH 6-8, dH 6-12, temp. 24-27 C. There are other sports of this species in the trade, including long fin and albino varieties and a cross between this species and the Flying Fox below. Epalzeorhynchos kalopterus (Bleeker 1851), the Flying Fox. Asia; Thailand, Borneo, Sumatra. To a little over six inches in length. Cond.s: pH 6.5-7, dH 5-8, temp. 24-26 C. Shown: four and six inch aquarium specimens. Epalzeorhynchos munense (Smith 1934), sold interchangeably with E. frenatum as the Rainbow or Red-Finned Shark/minnow and Albino Shark in the aquarium trade. Differentiable by position of dorsal fin. Base starts ahead of pelvic fins in E. munense, just at in E. frenatus. To a little under five inches maximum length. Labeo (Morulius) chrysophekadion (Bleeker 1850), the Black Shark/Sharkminnow. Asia and the Malay Archipelago. The largest minnow "shark" species kept at 32 inches maximum length. Cond.s: pH 6.5-7.5, dH to 15, temp. 24-27 C.
Labeo (variegatus) cyclorhynchus Boulenger 1899, the Variegated Shark (to science, the Harlequin Sharkminnow). Central Africa; Congo and Ogowe Rivers. To a little over six inches in length. Cond.s: temp. 21-27 C.
Genus Luciosoma: Subfamily Rasborinae. Five species. Luciosoma spilopleura Bleeker 1855, the Apollo Shark/minnow. Southeast Asia; Thailand, Borneo, Sumatra. To ten inches in length. Cond.s: pH 6.5-7, dH 5-8, temp. 24-27 C. Best kept singly. Other species in this genus are sold by this and other common names (L. bleekeri, L. setigerum, L. trinema). Other Minnow Sharks: Yes, there are quite a few. A normal and xanthic ("Golden Shark") form of the Hard-Lipped Barb, Osteochilus hasselti (Valenciennes 1842) are occasionally still imported from Indonesia, where this is a cultured food fish. There are at least 3, 4 other species of "Flying Foxes", genus Epalzeorhynchos (E. siamensis, E. stigmaeus, E. coatesi), various Garras, and don't even get me started on all the fishes that are sold as SAE's (Siamese Algae Eaters... mainly of the genus Crossocheilus). There are more: the Diamond Shark, Cyclocheilichthys apogon (Valenciennes 1842), The Flying Arrow Shark, Dangila festiva. the Sucker-mouthed Shark, Barbichthys laevis, various shark-like species of the genera Labeobarbus. Leptobarbus (particularly L. hoeveni and L. melanopterus). 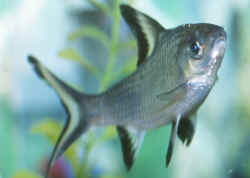 Other FW "Sharks": There are a number of other "sharky" freshwater fishes with this common name. Myxocyprinus asiatica asiatica... the Chinese "Shark"... actually a Sucker, family Catostomidae... not a minnow family member. To two feet in length (60 cm.). China (Yangtze River basin). These Minnows are widely spread over Southeast Asia, the Malay Archipelago into much of Indonesia, parts of the Middle East into much of Africa. Given for the popular species above... some of the Labeo of Africa reach a couple of feet plus. Better specimens of these species are easy to discern, if not to find. They're the ones who have the least-shredded fins and missing scales amongst their kind. Do wait on "new batches" that have just arrived at a dealers for a good few to several days. If these animals have been housed in unsatisfactory conditions, or been shipped in unhealthy ways they will die like "proverbial flies" in a few days time of arrival... with little to nothing to stop them. Be ware of buying specimens if any in the tank show signs of bloody markings or cloudy eyes. Observe the batch for a short while... the current "winner" will be obvious. This is the one you want in the case of Epalzeorhynchus and Labeos. Balantiocheilos are generally excellent or obviously dying. All fishes purchased should have a good "index of fitness" ... they should be well-fleshed/not thin. Like other Minnows used in the aquarium interest (Barbs, Danios, Rasboras, Whiteclouds, Goldfish, Koi, Dace...) the Minnow Sharks display a wider tolerance to water quality conditions in captivity than they are known to experience in the wild. Nonetheless, these fishes do best in larger, more constant physical and chemical settings. Near neutral pH, softer water than many municipalities provide and tropical temperatures suit them. As a group they are sensitive to tapwater sanitizers (chlorine, chloramine) and should have their water pre-mixed/neutralized with water conditioner before it is applied, or better, stored and aerated for a week ahead of actual use. In the wild, many of the freshwater Shark species inhabit what looks like muddy, silty water, but don't be fooled by appearances. Many, many of these species are lost in the wholesale end of the interest by being too lax in water quality maintenance. Their behavior changes (loss of color, movement) in the face of accumulating organics is profound... They need brisk circulation, aeration and complete (chemical, physical, biological) filtration. Do develop and adhere to a regular protocol of changing filter media, gravel vacuuming/water changes (ideally weekly) and checking an aspect of nutrient build-up (like nitrates). You will be richly rewarded. Is a huge point with all but Balantiocheilos, which are shoaling species. When small, and crowded together, a large number of cyprinid sharks may be successfully kept in a small system... given adequate, continuous food availability and plenty of hiding spaces (best provided with bunch-type plants). As Labeo and Epalzeorhynchos grow they almost always become aggressive toward their own kind (and often toward other fishes... particularly similar-appearing species) to the point of murder or starvation... Unless you have a very large tank (for larger species, a hundred or more gallons) and plenty of cover... placing more than one specimen in a tank is not a good idea... And should only be attempted by way of introduction as young, and grown together by people so inclined and outfitted. The only time the cyprinid Sharks can be sexually differentiated only with surety just before spawning (a few days to weeks), when the females are obviously egg-laden and males develop "pre-nuptial" tubercles (fleshy growths on their heads). Red-Tail, Rainbow and Red-Finned Sharks are all bred commercially, usually in the orient, typically with hormonal manipulation to induce gamete production and reproductive behavior. They're egg-scatterers with the parents depositing their sticky spawn amongst plants/pots... and egg-eaters, so they need to be removed after spawning. The young hatch out in 2-3 days and are fed on cultures of infusorians and Artemia nauplii. Minnow sharks are principally herbivorous and will only do well being offered some vegetable fare daily. The best way has been noted (using some palatable live plant material) or blanched/microwaved terrestrial greens (zucchini, other squash, peas...), but dry-prepared foods, fresh, frozen/defrosted greens are accepted with gusto, once these fishes become familiar with them. Like all general herbivorous animals these fishes need more frequent feedings... two times a day at a minimum, better to provide some continuously via live plants, and/or occasionally with automated feeders and flake, pelleted offerings and/or in-tank feeder cups with live or freeze-dried foods in them. These fishes are very susceptible to white spot/ich disease, particularly if weakened by poor water quality coupled with a chilling episode. Fortunately they are also good candidates for treatment with aquarium medications (and elevated temperature)... but are amongst the first to "catch" ich and succumb from it if not treated promptly. Again, these fishes are great bio-indicators. Should yours appear listless, display a loss of color, interest in feeding, check your water quality immediately. The Minnows called Sharks do at least have sickle-shaped dorsal fins... and some display real shark-like behavior to members of their own species... but given good initial health (from careful selection on your part), decent, steady water conditions, decor, plenty of mixed foods/feeding, and a secure, complete cover, these cyprinids can be real assets for good-sized freshwater systems. Axelrod, Herbert R. Labeo bicolor, the Red-Tailed Black Shark. TFH 1/59. Edmonds, Les. 1996. Freshwater "Sharks". TFH 11/96. Fink, John A. 1975. The Tri-Colored Shark, Balantiocheilos melanopterus. TFH 2/75. Hunziker, Ray. 1992. The Sharks that aren't. TFH 4/92. Mecke, Klaus. 1959. Balantiocheilos melanopterus. TFH 10/59. Taylor, Edward C. 1991. Freshwater Sharks- the 'name game'. Pets, Supplies, Marketing 11/91. Tavares, Iggy. 1999. The Red-Tailed Shark. FAMA 5/99. Vajdak, Bohumil. 1986. Spawning Labeo frenatus. TFH 10/86. Walker, Braz. 1968. The Tri-Color or Bala "Shark". The Aquarium 10/68.